Why Is Reducing Waste Important & How Can I Do It? We hear the words without truly grasping their meaning, a fatal flaw of being human. “Reduce, reuse and recycle”; for some reason, from the time we are very young, that last piece of the statement is the only thing we focus on. But until you take the steps to reduce your waste, your efforts are doing absolutely nothing for the planet. That bold statement is truer than ever before, thanks to the changes to recycling protocol in China. We can’t only depend on the sorting service that Green Think offers. We need to start all the way in square one, when you are standing in the isle of your local grocer, choosing a product. Have you ever considered the ways you can very simply reduce your consumption? One of our latest blogs discussed the rigid changes in the recycling that China is accepting. For decades the country took on the trash of the world, incorporating the raw products back into their economy, and even selling the repurposed items back to us. However, it has gotten to the point that they were no longer just getting recycling, and instead were sorting through hoards of unusable, dirty recycling (a.k.a. trash). We’ve started to already feel the deep ripple effects with the new rules on our waste management bins in Salt Lake City, Utah. But these changes are further reaching than we could imagine. For instance, the city of Westborough, Massachusetts is being buried under waste. The disposal of paper is becoming an issue. There are 150 to 200 tractor loads of paper stacked 12 feet high, waiting for the opportunity to be reused—something that feels impossible right now. How long will it take the recycling market to be found? How many more 12-foot stacks of recycling will we face? 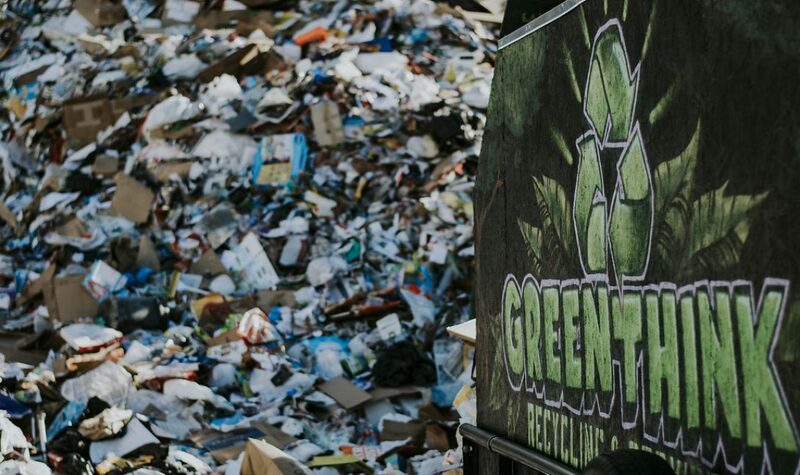 As we anticipate the coming “go green” wave, things that were once accepted as ordinary recycling—bubble wrap, shopping bags, plastic food covers—can no longer take refuge in your blue bin. While we ride out this waste management disaster, there is one solution that is simple enough anyone can take part. It’s time to reduce your waste. This isn’t a simple change that you can make overnight. You’ve got boxes of Ziploc sandwich bags in your pantry, waiting to be used. But by making incremental changes every week, you can become the zero waste hero you always imagined. When it comes to composting, it’s often the last thing on our minds. We’re so hyper focused on recycling, that it easily slips through the cracks. If you’ve got uncooked food, paper towels with no chemicals on them, compostable to go containers, coffee filters, used tissues and even loose hair, you’ve got the makings of an incredible compost bin. Talk to your local waste management officials to see if you can get a bin through them. Otherwise, you can build a bin on your own, to be stored in the corner of your backyard. Don’t let the tops of peppers or broccoli stems go to waste. Take the extra time to turn them into something healthy, like a vegetable broth. You can even freeze this to use at a future time. When you work in the modern office, this can be one of the hardest things to remember. Most places of work will provide paper plates and plastic utensils as a convenience to you. If you bring a set of reusable utensils with you, this action may spark your coworkers to do the same, further eliminating the amount of recycling that is currently stacking up. We’ve all had the nights when you get home from work and just don’t have the energy to do any cooking. Making a carryout order is nothing to be ashamed of. But this is where your go green mentality comes into play. As you place your order over the phone or online, always make sure to note that you want only food. This way, you can bring in your own reusable bag to carry out the containers. You also won’t get unnecessary utensils and napkins that will end up waiting to be shipped to a recycling facility. In some cases, the restaurant workers will be cheering you on for your efforts to save the earth (you didn’t hear it from me, but when you think green some places will reward you with a free dessert). It can be a challenge to remember your reusable shopping bags when you make your next trip to the grocery store. And when you take it a step further and eliminate plastic produce bags, you’ll feel like you’re packing a set of luggage for the trip. But by getting rid of these items, you’ll find that your waste management efforts go even further. Keep the bags in your trunk, next to your door or underneath your shopping list so that you always remember them. The next time you get a credit card offer, think of all the paper stacking up in Massachusetts. Don’t be someone who adds to that unnecessary recycling pile. Go out of your way to make a phone call or go online to cancel these offers. Your mailbox, and the environment, will thank you. This can be the easiest and most straightforward change you make. Invest in a high quality reusable bottle (and coffee mug). Your local waste management service and your wallet will thank you. When it comes to coffee mugs, some shops will even give you a discount for your efforts. The recycling crisis is more apparent than ever. By investing in Green Think recycling, we can help you with the sorting and making the most of your waste. But it’s up to you to take the initiative to reduce your consumption, or rather, to consume smarter.